Disclaimer: Did I say I was going to take better photos in ’09? Clearly you can see it’s a skill that still needs a lot of work. 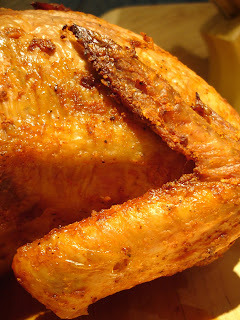 I know so many people who list Pollo A La Brasa as their favorite food, and I have to agree. Peruvian rotisserie chicken looks, smells, and tastes like savory heaven. 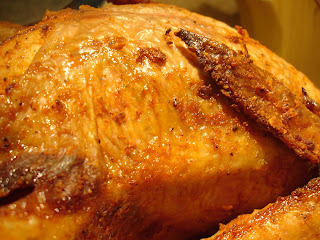 I’m a sucker for any good roasted chicken, but one rubbed down with herbs and cooked on a spit pretty much wins any Roast Chicken Contest. Ok, not that there is such a thing, but I’m just sayin’……….. I googled around until I found what I felt was a great Peruvian chicken recipe and got to work. 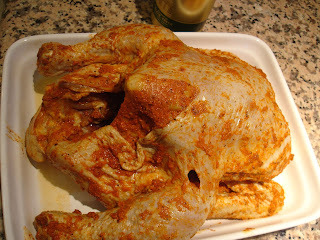 After combining all of the ingredients into a paste, I massaged it all over my 4 pound chicken, wrapped it up tightly in Saran Wrap and set it in the fridge for two days to soak up all the flavor. The smell of the garlicky marinade was utterly divine. 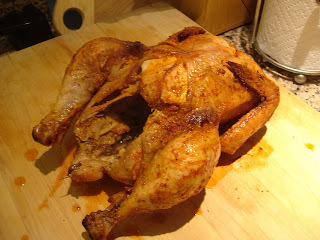 Raw and rubbed down chicken! In the meantime (meaning during the two days my chicken sat in the fridge) I tried my hand at making a big pot of Cuban black beans from this recipe. It’s always best to make soups/stews/beans/chilis a couple of days before you plan to eat them since the flavors come together so well while its resting. Something about this photo seems inappropriate.....?! 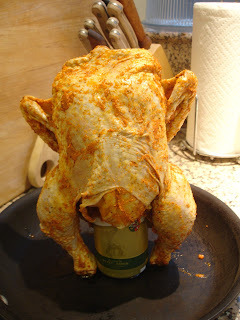 Finally, on Day Three, I took the bird out and let it come to room temp on the counter for a couple of hours before putting it onto a beer can- I figured it was the next best thing to a rotisserie, which I don’t have. I put the chicken in the oven, the beans on the stove and whipped up a simple slaw of cabbage, red onion, red bell pepper, green onion, cilantro and a Latin-inspired dressing of cumin, coriander, garlic, red wine vinegar and olive oil. So………..the verdict? Oooooh so good, super garlicky, savory and tender. I had to stop myself from eating all of the crispy skin and the meat was flavorful and juicy. And did I mention that it made the house smell like what Nirvana must smell like (if Nirvana has a scent, that is)??? It didn’t taste exactly like the ones I’ve bought in the past, mainly due to my lower salt content, but I’m looking forward to playing around with the recipe and making it a bit closer to Pollo A La Brasa’s version. The beans were also tasty, but I think I’m looking for more Mexican flavors. I noticed that a lot of the Cuban recipes call for red wine, and although it imparts a subtle flavor, the beans didn’t taste much like version I was hoping for. Crispy chicken skin is almost as good as bacon. 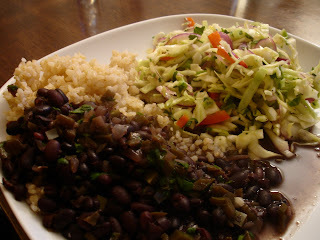 Does anyone out there (or anyone’s Mexican grandmother) have a killer black bean recipe? I’d LOVE to hear of a truly authentic, tasty recipe. yes...the pics do not do that chicken justice. i wish i had some now to pair with this cold ny weather! the combination of ginger, garlic, allspice, and orange juice is surprising and delicious. Oh man...Pollo ala Brassa. In Lima, there's a stand on almost every street corner.